When I started to write a little about the loss of my dad, I had many friends reach out to me. I had people I didn’t even know share a little bit of stories about their loved ones they lost and how they still think about them. The kindness of everyone’s messages touched me and were appreciated immensely. As I continued on with my baking and cooking as I normally do, so many recipes were reminding me of my dad. I considered how often we are recreating something someone special we lost used to make and we don’t realize that they are still inspiring us in the kitchen. Or maybe we do tackle with a purpose that one recipe that belonged to a grandmother, a mother, a father, a special friend. I realized that every time we make these recipes, we are keeping the memory of that special person alive. We have to keep thinking about them, even though sometimes it will be sad. Baking and cooking a recipe that was theirs or that they loved keeps their memory alive in our hearts. I reached out to some of my friends to share a recipe that reminds them of someone special that is no longer in their lives. My lovely and talented friend Paula from Vintage Kitchen Notes is opening the series. In a few emails back and forth we talked about what the series will entail and what her post could be about. Paula lost her dear brother and wrote several posts about him on her blog. One post in particular is a really beautiful tribute to her brother. He was a cancer fighter and fought it (and survived)twice like my dad did. For this first Food Memory post, Paula is sharing a recipe that is just calling my name. A delightful apple dessert-oh, Paula…thank you. What would be even better is sharing a crumb bar, a cup of coffee, and some great stories together in Argentina. I grew up in an apple and lemon family. There was no particular interest in chocolate, dulce de leche or strawberries and cream, no statuesque layer cakes at birthdays or bowls filled with homemade candy. Give them a good apple or lemon meringue pie. To this day they ask for that above all other desserts. Weird family, but hey, it’s the way they roll. I say they because I was sort of an outsider, preferring dulce de leche above all other flavors, and still my number one choice of sweet. This post is my contribution to Lora’s food memory series, which she started a few weeks ago in memory of her father. Food makes for strong, palpable family memories. And mine includes apples. ged that they didn’t include tomato sauce, the only way to eat meatballs according to him. So for today I went back to old fashioned, traditional, and almost simple looking apple cinnamon bars. But these are not plain Jane’s entirely, having brown butter and oats in the crumble and a touch of cardamom in addition to the best Vietnamese cinnamon I could find. These would’ve made the whole family happy, and the type of sweet you would find at my grandmother’s house if you went over for tea. She was the baker of the family, a trait I obviously acquired, and the only one with whom I could talk for hours about serious stuff like the latest Persian rice made on TV or whether crepes Suzette could ever make a comeback. If you’re a foodie, you need a space where to unleash your most intimate food issues and compare notes. Guess we have blogs now, don’t we? We all understand eachother’s quirks and obsessions in the kitchen. 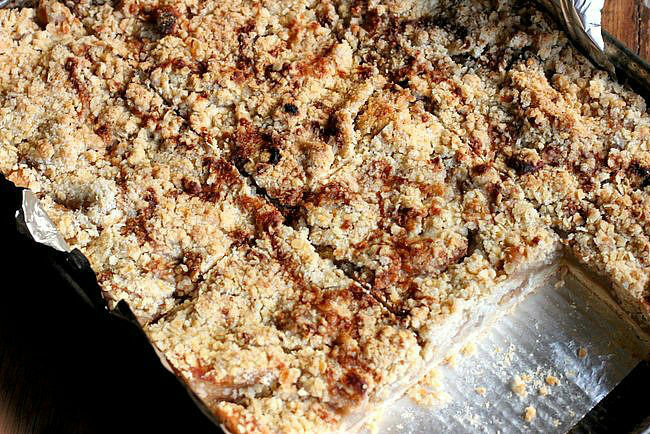 So I leave you with these brown butter apple cinnamon crumb bars, because sometimes all we need is comfort baking, and remembering loved ones that are no longer here with a smile. Thank you, Paula. It was a pleasure to read a little about your food memories. Comfort baking-yes, indeed. Paula is quite the baker. I get lost on her site wanting to bake and taste all that she makes! Like this recent caramel graham cracker almond-raspberry cinnamon rolls and her flourless chocolate bean cake (yes, bean!) and have got to bake this lemon frangipane bundt cake. This summer Paula shared her gorgeous Coconut Lime Cake on Savoring Italy. With a wooden spoon or electric hand mixer on low, cream butter with sugar until smooth. Add salt and flour in two parts, combining well. Do not over mix. It will be crumbly. Line a 9×13 inch (23x33cm) pan with aluminum foil or parchment paper and pat the dough evenly on the bottom. Lightly flour the tips of your fingers if needed to do this. Be sure all surface is covered as evenly as possible. Chill for 30 minutes. Meanwhile, preheat oven to 350ºF / 180ºC and bake for 15 to 20 minutes, until it’s dry and starts to color lightly. 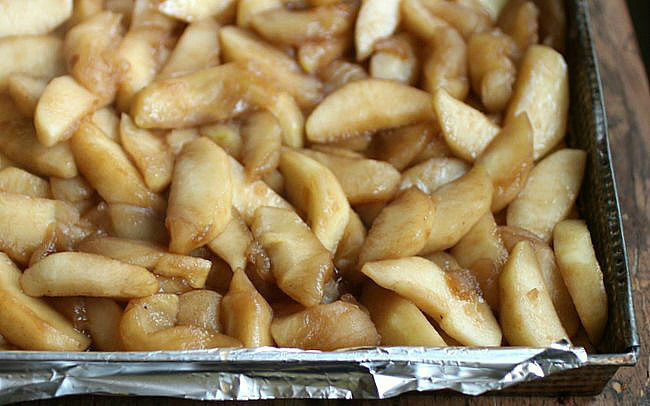 You might need to cook the apples in two batches depending on the size of your pan. Melt butter in a large skillet over medium heat and let it foam. Add sliced apples and cook, stirring once or twice, until they begin to soften, about 4 or 5 minutes. Add the sugar mixed with the cinnamon and cardamom, and cook over medium/high heat, stirring often, until they begin to caramelize but still retain their shape, about 5 minutes. Scatter apples, without the juices that have collected in the bottom of the pan, evenly over the prebaked shortbread base, careful not to tear the dough. To brown the butter, melt it over medium heat on a deep sided pan. It will foam and then start to chirp furiously, with very large bubbles. When this noise and bubbles begin to subside, the butter will start to color. You want a deep amber color but be careful not to burn it. Transfer to a bowl or shallow plate and chill or freeze until solid but not rock hard. In a food processor, mix flour and sugar. Add butter and process until it begins to clump. Add oats and pulse a few times to mix, but not to pulverize the oats. 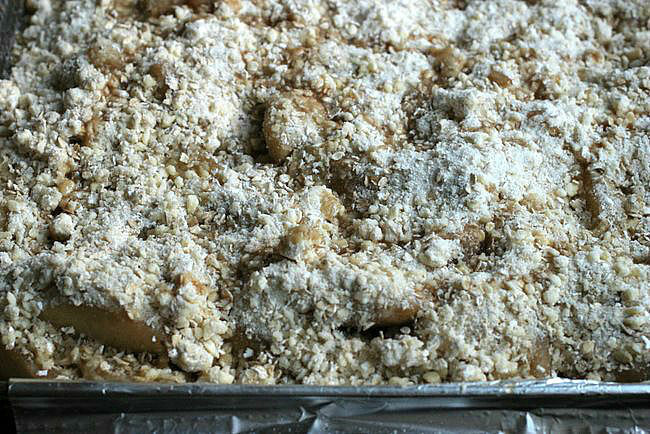 Add the crumble evenly on top of the apples and drizzle the juices from the apples over it if you want to. Bake at 350ºF / 180ºC for about 30 minutes, until the top is golden. There is nothing plain and simple about this recipe. Or Paula. She truly is amazing. Oh my goodness what luscious bars! The crumb topping is calling my name. And I can see my family enjoying these too. And thanks to Paula for sharing her memories and to Lora for starting this wonderful series. This is a lovely idea, food memories. I recently held a coffee morning in aid of Macmillan Cancer Care in memory of my Father and Father in law, a similar idea. These look delicious too, brown butter, apples, cinnamon – a great combination, I will be trying these! I agree-these bars and Paula are truly amazing! Food memories are so important. They help us cope and remember our loved ones. So many foods remind me of my grandparents and I love that because then I know they are watching over me. These bars will definitely provide some comfort! These bars are calling my name! With brown butter, apples and cinnamon, they are comfort baking at its best :). Apples-yes! Shortbread crust-yes! Crumbles – yes! Memories – the best! This is a lovely post and wonderful series! Kudos!! What a lovely series! And a scrumptious recipe Paula! Food memories evoke so many emotions and attach a special significance to times and places in our past. When I lost my dad it was not unexpected, but I still miss him everyday. With the passing of time the memories have shifted and shuffled and I can recall the better times before his illness with a smile in my heart. I love comfort food. This was exceptional. As soon as I saw the picture of the cooked apples I could smell the delicious cinnamon. Memories and food so often go hand-in-hand. I know quite a few dishes that remind me of specific people (and circumstances when the dish was consumed). Anyway, lovely dish! An awful lot of flavor is packed into this, and it looks so nice. Good stuff – thanks. Wow Lora, it melts my heart to read all the comments. This is turning into a more special post than I anticipated and I thank you for asking me to do it! Be well my friend! I am glad that there are more people who do not eat just to survive, for whom the food is not pure energy, but represents much more intertwined layers of life. Smells from someone's kitchen unavoidably bring memories from years, even decades ago (the smell of roasted red peppers takes me back to the Fall of 1987 every single time). The reason to love food is the memories that we have made and will make in the future. I love the flavor and texture of apples but they really remind me of my grandmother and times spent with her, watching her bake in her little kitchen. I'm glad to see both of you here today and I hope you both have a great end to your week. Hugs! I love that you started this Food Memory series. I love reading fun posts and looking at great recipes but most of all, I love reading stories that people share .. the blog posts that make you stop and think and smile or cry. These are the best kinds of blog posts I think. . I can't wait to read the rest of the series and I feel so honored that you asked me to be a part of this. Because of your wonderfully written and heartfelt opening, I read all three posts about Paula's brother. . posts that I had never read before. . I am so glad that I did. What a great series, Lora. And a seriously amazing post to start with. Those look so delicious. What a lovely, post and so heartfelt. Love the idea of this food series. Food memories are the most powerful I think! So happy to have found you via Paula! 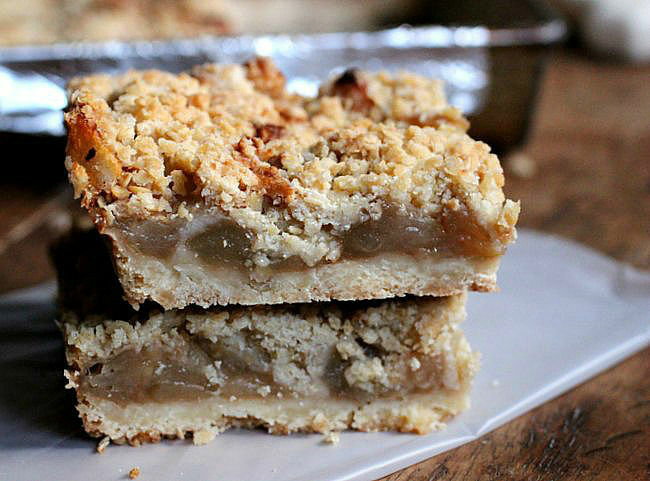 I just made these last night with apples off our tree and they were fantastic! A little bit time consuming with a few extra steps like browning the butter for the strudel, but worth every second! Happy you liked them Danielle! I have browned butter in the fridge regularly, and use it like regular butter. YUM! I adore Paula to no end and she did a fabulous job with her food memory guest post. 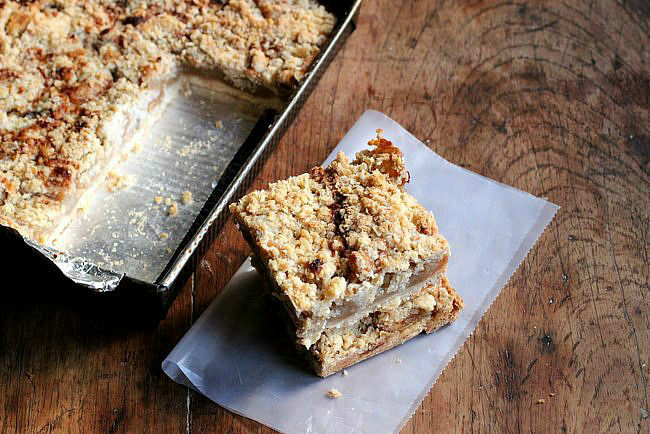 These apple crumb bars look incredible. My husband, who loves lemon and apple desserts, would be all over this. Lora, I'm loving this series so far and I can only hope that my post will do it justice (yikes, I'd better start thinking of something wonderful for you).